This research investigates the pollen geochemistry of Atlas cedar, and what it could tell us about incoming Ultraviolet-B radiation (UV-B) on historic timescales in North Africa. So, what is pollen? what is pollen geochemistry? what is UV-B? and why is any of this important? Read on to understand this research in plain English! Firstly, pollen. Most people, especially hay fever sufferers, will know that pollen is the yellow, fine powder substance released by trees and plants for reproduction, usually during the spring and summer months. Pollen is made of an extremely resistant substance known as sporopollenin. It is able to resist harsh environmental and climate conditions, and it can survive in the environment for millions of years. 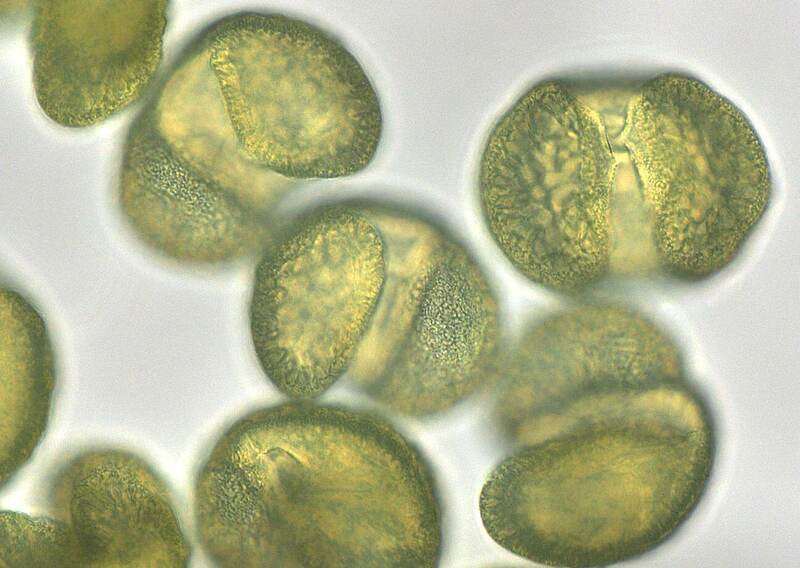 Pollen grains from different plant species have distinctive shapes and patterns, which allows them to be identified. This has allowed palynologists (those who study pollen) to analyse pollen in historic archives (such as peat bogs) to identity the types of vegetation that existed in past environments. This can be used to track changes in plant species over time - such as plant migrations. It also allows us to infer historic climate conditions - for example, archives rich in grassy pollen may indicate dry and/or cooler conditions, while archives rich in tree pollen may indicate wetter and/or warmer conditions. Light microscope images of Atlas cedar pollen (630x magnification). So, what is pollen geochemistry? Pollen geochemistry is the study of the chemical make-up of pollen - and using this information to determine climate or environmental conditions. Since we do not have instrumental records of climate or the environment on long-term timescales (e.g. thousands to millions of years ago), we can use pollen as a "proxy" (a representation) of historic conditions. For example, pollen geochemistry (stable carbon isotopes) could be used to determine moisture conditions (Bell et al. 2017) (available open access), of the environment in which the tree or plant was growing, at specific times. How does this work? Simply put, the different chemical compounds which make up the pollen grain may "respond" (i.e. change) to climate or environmental influences. So, while the pollen grain is developing, its chemical composition may change depending on the local climate and/or environmental conditions during this time period. For example, this might be a change in the amount of a specific compound in response to increased climate stress (i.e. the abundance of the compound increases or decreases). We can measure these compounds, and using our knowledge of modern-day relationships (between pollen and the environment), we can determine (with fairly good certainty) the climate or environmental conditions at the time of the pollen's development. This can be done on pollen found in historical archives, which may be thousands or millions of years old. Therefore, we can determine past climates and environmental conditions. Check out Jardine et al. (2016) for a great write up on using pollen geochemistry to determine past solar radiation levels (available open access). So, how does this relate to UV-B levels? Ultraviolet radiation is electromagnetic radiation which mostly originates from the sun. Some of this radiation reaches the Earth's surface, although a lot of it gets absorbed by the Ozone layer. UV radiation can cause chemical reactions in living things on Earth, which can be both beneficial and damaging. For example, you may need to wear protective clothing or use sunscreen outside when UV levels are high. Plants can also be damaged by too much exposure to UV-B radiation (280 to 320 nm). In response, plants have developed several defensive mechanisms to protect themselves against UV-B damage. This includes the production of UV-B absorbing compounds (UACs) in plant tissue (including pollen). These compounds essentially act like an in-built sunscreen. So, the amount of UACs will increase in pollen, in response to increased UV-B exposure from the sun. We can then measure the amount of UACs in pollen using specialised equipment, and this can tell us about UV-B levels - and we can do this on pollen that may be thousands or millions of years old. Check out Seddon et al. (2017) for a look at methodological approaches to measuring UV-B levels from pollen. FTIR spectra of Atlas cedar pollen. Ultraviolet radiation makes up a small percentage (around 5-6%) of the total solar radiation coming from the sun that reaches the Earth's surface. And, UV-B radiation makes up an even smaller percentage of the total solar radiation reaching the Earth's surface (around 0.2%). Despite the low numbers, UV radiation can influence human and plant health, plant distributions (i.e. where plants are found growing), pollution levels, and it can also influence climate conditions. A greater understanding of past climate/environmental conditions allows us to better understand plant species distributions, how they adapt to changes, and what conditions they can tolerate. And pollen geochemistry allows us to not only determine UV-B levels (which could also be used to extrapolate total solar radiation), it can simultaneously be used to determine climate conditions (using stable isotope analysis). Potentially, this could increase our understanding of climate and solar radiation interactions - and what effect this has on Earth. And this allows us to better prepare for future climate change - for example, determining where crops might flourish in the future. Atlas cedar trees growing in the Middle Atlas, Morocco. So, what exactly did this research find out? In our paper, the study focused on the pollen of Atlas cedar, an endangered conifer tree native to North Africa. We analysed the geochemistry of modern pollen from Atlas cedar trees growing in Morocco, and found that the amount of UACs in the pollen increased in response to higher UV-B levels. We also analysed pollen from Atlas cedar trees growing across Europe, and some trees growing in the USA*. We found that while UACs also increased in response to higher UV-B levels in these samples, they did so in a way that was "out of line" with the Moroccan trees. In other words, in the non-native Atlas cedar trees (those found outside North Africa), something else is influencing the geochemistry of their pollen - specifically, the amount of UACs in the pollen. We speculate that there may be some genetic influence or control on the amount of UACs found, due to the strong similarities between the geochemistry of the non-native samples and the native samples from their place of origin. This is potentially quite important as climate and environmental proxies often use modern samples from across large environmental gradients, in order to calibrate the influence of climate/environmental conditions. It is usually assumed that plants will respond in the same way to climate/environmental conditions in the past, as they do in the present. This assumption is key to determining past conditions. Consequently, we suggest that, at least for determining historic UV-B levels, modern calibration of the proxy is only carried out using native plant/tree samples, and should not include samples grown in botanical gardens. Our study shows that analysis of the pollen geochemistry of Atlas cedar, could be used to determine historical UV-B levels in North Africa. This has potential to investigate links with climate change, and plant distributions in the region, which is quite exciting! There is still a lot we do not know about pollen geochemistry and how it is influenced by the climate and/or environment. It is a developing research area, with lots of exciting on-going research, which could potentially revolutionise what we can learn about past environments. Thanks for reading, please leave any comments or questions below. *Many thanks to collaborators who supplied pollen samples for this study: Penny Jones (Westonbirt Arboretum), Martin Gardner (Royal Botanical Gardens, Edinburgh), Kathryn Richardson (Arnold Arboretum, Harvard University), Stephanie Desprat (EPHE, Bordeaux), Daniel Gomez (Instituto Pirenaico de Ecologia, Spain) and the Paris Botanical Gardens. The UV-B data used in this study was interpolated from the glUV global UV-B radiation dataset: http://www.ufz.de/gluv/ (Beckmann et al. 2014). Details about the dataset can be found on their website. A guide showing how the data was interpolated for North Africa, using R, will be available on this blog soon. Summer UV-B levels across North Africa - data interpolated using glUV datasets. UV-B absorbing compounds (UACs) in Atlas cedar pollen - My latest research which looks at the relationship between summer UV-B and UACs in the pollen of Atlas cedar trees, which could be used to tell us about historic UV-B over North Africa. Sample data used in this study - All the original data used for this study, freely available on Mendeley Data. Pollen and spores as biological records of past UV-B - Great paper looking at pollen geochemistry and how it can be used to determine past solar radiation levels. (Jardine et al. 2016) Available open access. Improved quantification of UACs in pollen - Great paper looking at the methodological approaches to measuring UV-B levels from pollen (Seddon et al. 2017). Wikipedia: Pollen - Everything you ever wanted to know about pollen. Wikipedia: Ultraviolet radiation - All about ultraviolet radiation. Solar and Ultraviolet Radiation - More info on solar radiation and ultraviolet radiation, and its effects. 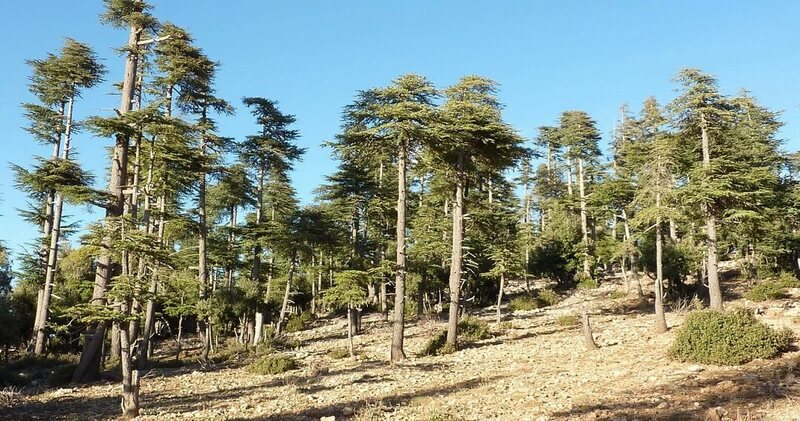 IUCN Red List: Atlas cedar - Information about the threats facing Atlas cedar (Cedrus atlantica) trees. glUV-B global dataset - A global dataset containing average UV-B data, available to download for free.